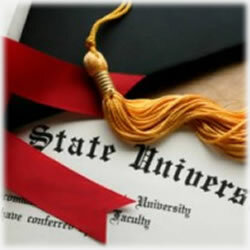 There was a time in the not so recent past when a college degree held a certain prestige; parents happily spoke of their sons and daughters who were now working on Wall Street in an impressive position on the 10th floor – and crediting that good fortune to the degree that was surely hanging on that son’s or daughter’s office wall. Now, though, with college expenses rising as quickly as student loan debt, we thought we’d take a look at some common sense approaches for those who don’t have that cap and gown ceremonial memory. And guess what? Despite studies that still suggest a college education is the sure fire way to financial freedom, credit cards that are paid in full each month and a life that doesn’t include mortgage payments, there are plenty of folks who are sharing the same financial freedom as their degreed counterparts. The truth is, though, I’ve never used it. I began writing in my senior year and am working as a freelance journalist. Turns out, my passion for finance has brought me to a place I could never have imagined and I love it. And she’s doing just fine from financial aspect, too. “I get to travel, I work from home most of the time and I’m not in the hustle and bustle of New York traffic every night”. Her story’s not much different than other folks, either. If the recession taught us anything, it’s that money isn’t everything. Another interesting aspect we found were those who never intended to go to college and who were confident they’d find exactly what they were looking for in terms of their career success and satisfaction. said Jeff. He’s now managing six ivy league graduates at a brokerage house in the midwest. No one resents me for it, either. It might be a different story if we were in the mid 1990s, but these days, no one really cares if or where you got your degree – they only want to know you’re not going to embezzle money, that you are going to to show every day and you’re in it for the long haul. Indeed – the employers we spoke to say they put an emphasis on keeping employees that have been with their company for awhile. With so many layoffs in recent years, those who managed to keep their positions are well taken care of – they’re the ones who know the ins and outs of their daily jobs. We also asked a few quality control employees at a ballast plant in the southeast the secret of their success, whether college played a factor in that success and if they could, would they go back for a “re-do”? The collective answer was that they couldn’t imagine anyone who’d want to go back for a do-over. They were making slightly less than their boss, who has a degree, and because they’re in the “trenches” (their word), they know how to hustle. We respect our boss, but the fact is, he wouldn’t make it thirty minutes in this warehouse. My sister got married right out of high school. She had no interest in going to college. She’s blissfully happy, has put on twenty pounds through three pregnancies and she has a husband who adores her. I envy her. And finally, our guys in the manufacturing plant said they too sleep well at night. We aren’t surprised at all. With their moms and wives happy, a paycheck every week and a genuine love for the work they do every day, these are the images of a newly defined “wealth” in this country. Can’t get much better in terms of a secure future than that!